Concerts are a part of the NSR culture. We encourage and promote every student to be star performers on stage. Playing the instument is not enough. We organise concerts every year for junior and senior students separately. The students get the exposure to play on stage and also communicate with other musicians. They learn how to syncronise and play as a band. Concerts help students to overcome stage-fright. They enable them to become better team players and learning this can help them to understand the importance of a team. These Concerts are a huge hit among the youngsters and is something which every student looks forward to. The parents get the first hand experience of seeing their star son or daughter play on stage. 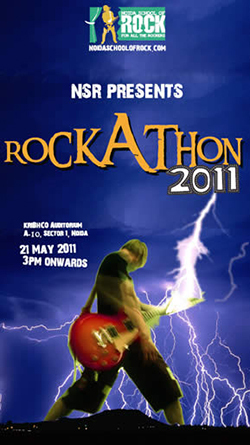 Rockathon is our annual concert wherein 18 bands from NSR take part.Apart from this we organise 'Voices' three times in a year for our vocal students which includes Piano Recitals as well.